I love this Corner Bakery in Atlanta. Every couple of years I fly into Atlanta for the Passion conferences and this is one of my favorite stops for breakfast before I start my day. It’s located right off of Peachtree St. in the heart of downtown Atlanta. Corner Bakery Cafe is a fast casual restaurant that started making artisan breads and freshly baked sweets on a corner in Chicago in 1991 and then eventually went to soups, sandwiches and salads. Now they have locations all over the U.S. We even have one in Phoenix where I live. I personally come here for their awesome breakfast paninis (my favorite is the Anaheim panini). The eggs are nice and fluffy and they use fresh ingredients. 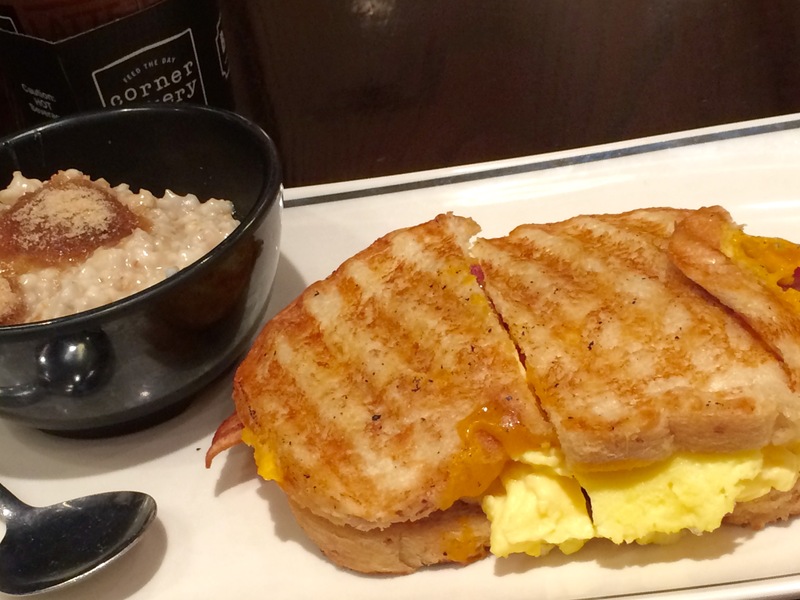 This most recent trip I got the Bacon & Cheddar Panini with a side of steel-cut oatmeal. Along with some coffee, it made for a great start to my morning.